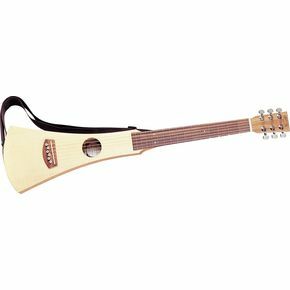 The Martin Steel-String Backpacker is truly a guitar that can be taken anywhere. This diminutive instrument may look like a joke, but the solid tonewood top with the solid mahogany neck, back and sides has this little number producing a sound that will surprise you. While this instrument in no way produces the sound of a large, full-sized guitar, for its size the sound is surprisingly loud. While you really have to work to bring out the bass notes, for simple songs and fooling around, you can’t ask for a better deal. And at only $199 (including a heavily padded travel bag), the Martin Backpacker travel guitar definitely won’t break the bank. Designed for those who are “on the move,” the Martin Steel-String Backpacker is built to take a beating. Martin has some amazing acoustic guitars for sale, and the Backpacker, given its size, is really no exception. Take it with you camping, traveling, hiking, it doesn’t matter … you’ll be able to find space for this travel guitar. And you’ll be glad to have it with you for everything from campfire songs to passing the long hours between flights in the airport. Appalling instrument. You must be getting something from the company. The fact you wrote such a positive review for a rubbish thing (it’s def. not a guitar), has made me move straight on to look for more honest websites.